For our daughter's first Halloween we decided to use her "larger proportions" to our advantage. We didn't spend any money to create the costume. The onesie was a pink long sleeved onesie hand me down from her cousin. 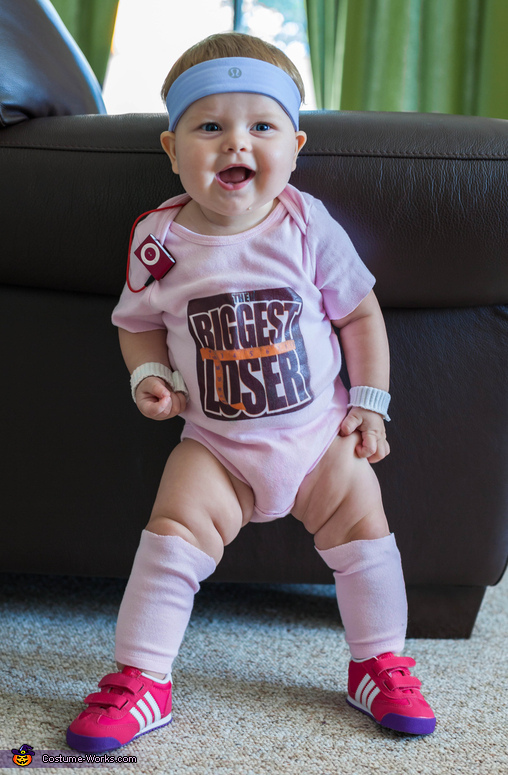 We cut the sleeves to use as leg warmers and printed the Biggest Loser logo from online onto the onesie. The Adidas shoes were a gift from a relative who works for Adidas (and got them for free). The Shuffle was a company Christmas gift from several years ago. The wristbands were the tops of old socks and the headband (one of mom's from several years ago) was clipped in the back with a bobby pin. How do you print this on a onesie?? Or are you willing to sell yours? ?